Oklahoma City Thunder fans may be a little slow in comprehending the truth – They just lost on their home court for the first time in this postseason, and it didn’t have anything to do with the referees. 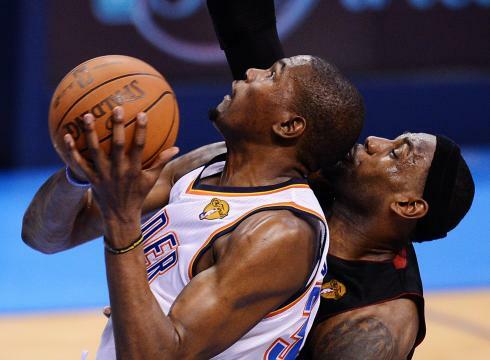 Kevin Durant missed the potential game tying shot not because LeBron James fouled him. He simply missed the shot. Maybe in a first quarter of a game some referees would call this a foul. But James used reasonable physical pressure on Durant, keeping his body on him. He didn’t push him, shove him or hit him. There was little contact, but I don’t think we want NBA referees, especially in crucial moments like fourth quarters of NBA Finals, calling plays like this as fouls and sending players to the line. The Miami Heat were simply better for the first 24 minutes once again. Once against the Thunder steamrolled their way back, but the Heat did just enough to hang on this time. Not letting the game get away from them, not letting Kevin Durant completely take over and go wild. If you rely on a 50-50 call from the referees to save your game, you probably didn’t do enough to win when you had the chance.